Washington, NJ: An innovative drying system from vibratory process equipment manufacturer The Witte Co., Washington, New Jersey (www.witte.com), features an integral baghouse dust collector positioned directly above the fluid bed drying zone. A concept pioneered by The Witte Company, this configuration contains 100% of the fine particles entrained in the airstream and allows them to remain in the dryer for processing as product rather than collecting them remotely or accepting their loss as waste. The Witte dryer design enables food, chemical, and other powder and bulk material processors to specify fluid bed dryers or coolers for products less than 250 µm in size in applications where conventional fluid bed dryers cannot be considered as viable options. 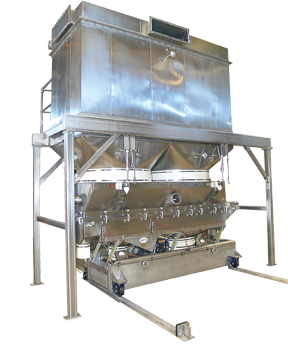 Ideal for closed cycle drying products that require nitrogen purge or solvent recovery, the integral baghouse drying system is also proven effective in drying and cooling spices, grains, vitamins, sugar, and a wide range of other products. In addition to processing fine particles, the space-saving integral baghouse dust collection system also eliminates the need for remote dust collectors along with their associated drums, conveyors, ductwork and other equipment. The systems are custom-designed and manufactured at the company’s Washington, New Jersey headquarters and are backed by the company’s 80-year history of customer satisfaction.